Manufacturer of a wide range of products which include chlorine tablet for poultry disinfection, ddac & glutaraldehyde based disinfectant, odor locking agent, poultry descalant and peracetic acid for poultry. Chlorine Tablet for Poultry Disinfection are inorganic white tablet form of chlorine for quick and effective dosing. It strongly smells of chlorine, owing to its slow decomposition in moist air. It is preferably used in soft to medium-hard water and serves an effective disinfectant for feed water lines, etc. 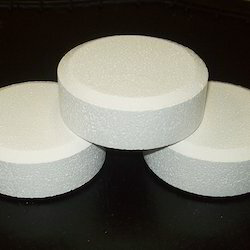 Chlorine tablets are calcium hypochlorite with added ingredients/ stabilizers mostly cyanuric acid to prevent moisture contamination and degradation. 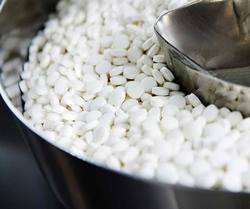 Chlorine Tablets contain more amount of available chlorine, about 90%. It also reports low chlorine loss owing to the absence of heavy metal impurities. They are available in many sizes, specific of their application. Chlorinet Tablet for Poultry Disinfection finds most applications in disinfecting drinking water, water feed lines. • They provide a strong residual disinfection in the distribution system. DDAC and Glutaraldehyde based Disinfectant is used as a broad spectrum terminal disinfectant with versatile applications. QAC Disinfectants have a wide spectrum of activity. 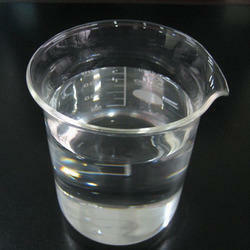 It is an effective biocide in water treatment, tanning industries, petroleum and plastic industries. Glutaraldehyde and QAC Disinfectants have an important role in preventing spread of infections. Hospitals and restaurants are centers for transmission of diseases. Nontoxic and excellent material compatibility make their usage widespread. CHEMTEX'S range of Disinfectants is a blend of cationic quaternary compounds (QACs) and low foaming surfactants for disinfection and cleaning properties. • Disinfects medical instruments, dialyzers, labs, etc. Poultry Odor Locking Agent is produced using natural nontoxic minerals. These crystals in their honeycomb structure of small pore spaces lock up alkali scent from bird litter. Repeated introduction to ammonia gases from urine can influence the respiratory well being and performance of humans. This exceptionally permeable, regular mineral absorbs double the ammonia and moisture than the similar products. Furthermore, odor locking chemical expels scent from the pens, bedding and essentially enhances environment for everybody. Subsequently, the bird flock stays dryer and cleaner, without getting dried out or irritation to the birds. It has been field tried and demonstrated in some strenuous situations. It makes a cleaner and fresher environment for the flock. Poultry Odor Locking Agent of Chemtex Speciality Limited has been developed wit extreme care for poultry and humans. Conditions in poultry sheds turn unhygienic, allowing the increase of poultry diseases like Salmonella, E. coli and Campylobacter, which directly affect the wellbeing and nourishment of the fowls. A proficient cleaning project is important in each poultry bio-security program. The sole purpose of disinfection is to minimize the number of pathogens, even causative agents and thereby reducing the potential of disease occurrence. The season of sanitization must be after de-populating/ exhausting the old chickens and entry of new ones. Chemtex manufactures QAC based Poultry Descalant which prevents contaminations in the water feed lines. They are based on 2nd and 4th generation QACs which descales and sanitizes the same. 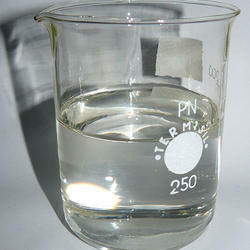 Peracetic Acid for Poultry is a peroxyacetic acid based liquid sanitizer for poultry industry. Its no rinse, non foaming formula, biodegradability and its ability to sanitize at cold temperature makes it ideally suited for various applications. Peroxyacetic Acid is approved by FDA certified laboratory for its non-toxicity. SGS approved for not having hazardous ingredients and NDRI approved for having excellent efficacy against various microbials. 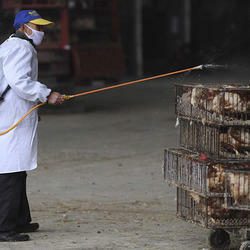 Looking for Poultry Disinfectant ?